Home Articles HEAR ROY BUDD’S AMAZING PHANTOM SCORE! 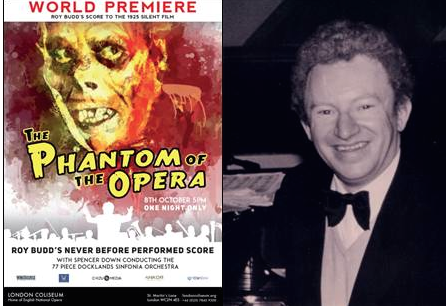 Legendary “Get Carter” composer, Roy Budd is to have his lost score for Rupert Julian’s silent classic film, The Phantom of the Opera, premiered at the London Coliseum, 24 years after his untimely death in 1993. On October 8th 2017, Budd’s masterpiece score will be performed by the 77 piece Docklands Sinfonia Orchestra, conducted by Spencer Down, alongside a screening of the silent film in a world premiere event. British jazz musician and composer Roy Budd, is best known for the film scores of Get Carter with Michael Caine and The Wild Geese with Roger Moore and Richard Burton. In 1989 Budd acquired the only surviving original 35mm reel of Rupert Julian’s silent 1925 film, The Phantom of the Opera, and lovingly restored it to its former glory before composing his own score to the film, a sweeping romantic symphony. Phantom is the sound of Budd blossoming from jazz virtuoso to classical maestro. A self-taught pianist and child prodigy, in 1953 aged six, Budd performed his first concert at The London Coliseum on the same bill as Roy Castle and went on to perform with stars such as Aretha Franklin, Bob Hope, and Antonio Carlos Jobin as well as scoring 40 feature films. Throughout his childhood Budd, who has perfect pitch, won a number of televised talent competitions, before releasing a single, “The Birth of the Budd”, when he was still a teenager, and becoming the resident pianist at one of London’s jazz meccas, the Bull’s Head pub in Barnes. In 1971, he sealed his place in film history when, aged 22, he was hired by Mike Hodges to score his grim revenge drama, Get Carter, starring Michael Caine. 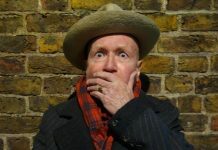 The music budget was a mere £450, but Budd, along with a bassist and a percussionist, recorded a spine-tingling harpsichord motif which is now iconic. In 1981 The Human League covered the theme from Get Carter on their multi-million selling album Dare. In 1989 Budd acquired an original 35mm film print to the 1925 silent film Phantom of the Opera from a collector. He restored the film to its full glory using an experimental two colour process and original tints from the film’s original release. Budd completed a full orchestral score for the film using an 84-piece orchestra and recorded this with the Luxembourg Symphony Orchestra. In 1993, with five weeks to go before a London premiere at the Barbican in partnership with UNICEF and European tour, Budd suffered a fatal brain hemorrhage and passed away at just 46 years of age. The concert was cancelled and Budd’s widow Sylvia was asked to foot the bill. Sylvia has fought for 24 years to give the score the public airing it deserves. Phantom of the Opera is arguably Budd’s greatest achievement: a grand soundtrack for full orchestra with several themes and leitmotifs that pay tribute to the great composers of the concert hall and screen, while at the same time unmistakably the work of its inspired creator.